On clicking that it takes to a page which says: Protect users on this computer against password theft with a sign-in seal. 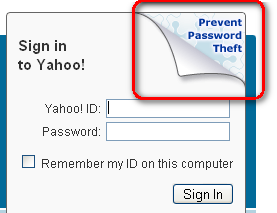 A sign-in seal is a secret message or photo that Yahoo! will display on this computer only. Look for it every time you sign in to make sure you’re on a genuine Yahoo! site. If the message, photo, or colors are different, you may have landed on a phishing site. Here you enter a 21 alpha numeric characters that you easily remember and the seal is based on these characters and displayed for that particular computer. Here you just upload a image of your choice which yahoo will resize and create a seal for you with that image. 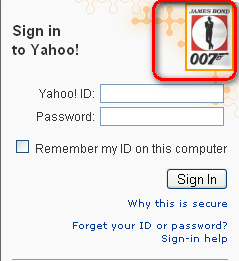 As usual I used a James Bond logo as my yahoo seal. After you save the seal, you should see the seal which you created whenever you visit a genuine yahoo site. You can see below the seal which I have created for my computer. So folks go ahead create a seal for your self and protect yourself from phishing. Well I found this feature of yahoo very useful. Have you created a Yahoo seal for yourself?